Getting Pumped Up for Spring White Water Rafting in Ohiopyle? With the temperatures rising to a balmy seventy degrees in January, the staff here at Laurel Highlands River Tours and Outdoor Center has started longing for Spring! This winter has brought with it some CRAZY weather. But it’s all good for us, and more importantly for you! Lots of snow and rainy warm-ups have helped maintain a full water table. This is the perfect recipe for GREAT springtime rafting! We should see some fun high-water days in the early Spring on the Cheat River in Albright, WV, and the Lower Yough in Ohiopyle, PA. And we can’t wait!! If you have never been rafting in the Spring, 2013 should be the year all that changes. It’s definitely an experience not to be missed. Don’t be scared of the cooler temperatures either! We have wetsuits available to rent at check-in, and Under Armour should be your best friend. The more layers the better! Wool and fleece socks with tennis shoes, and fleece gloves help keep the tips of your limbs nice and toasty. 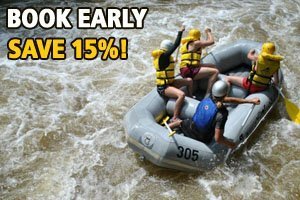 And to help get everyone in the mood for rafting, take advantage of our Pay Early, Save Big! Special. Call and make your reservations with full payment by money order or certified check by May 1st and receive 15% off! OR call and make your reservations with full payment by personal check or credit card by May 1st and receive 10% off. AND as a bonus to our blog readers, get $5 off your wetsuit rentals! Just mention code BPE to take advantage of these great deals!